Optical fiber based components and devices have been very successful in the past 30 years and will surely continue to thrive in a variety of applications including optical communications, optical sensing, power delivery and nonlinear optics[1-3]. With increasing requirements for higher performance, wider applicability and lower energy consumption, there is a strong demand for the miniaturization of fiber-optic components or devices. When operated on a smaller spatial scale, a photonic circuit can circulate, process and respond to optical signals on a smaller time scale. 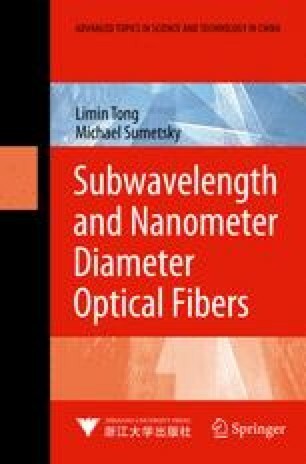 Only at wavelength or subwavelength size does the photonic structure manifest evident near-field features that can be utilized for interlinking and processing optical signals highly efficiently. For example, it was estimated that to reach an optical data transmission rate as high as 10 Tb/s, the size of photonic matrix switching devices should be reduced to 100-nm scale. At the same time, to perform a given function that relies on a certain kind of light-matter interaction, usually less energy is required when smaller quantities of matter are involved. Optical MNFs featured at subwavelength scale, provide a number of interesting properties such as tight confinement, high fractional evanescent fields, large and manageable waveguide dispersion that are highly desirable for functionalizing fiber-optic circuits with great versatility on a micro/nanoscale[5-7]. At the same time, taper-drawn MNFs provide excellent compatibility with standard optical fiber systems.